New book, 256 pages with 208 colour pictures, 18 drawings and one map. Harpia Publishing is proud to announce the launch of a new series, Russia’s Warplanes, set to become the standard reference work on the subject. Written by an acknowledged expert in the field, this will serve as an exhaustive directory of the latest products of Russia’s military aviation industry. As well as outlining aircraft that currently equip the various Russian air arms, the first of two volumes also takes into account aircraft developed for and fielded by foreign states in the post-Soviet era. Piotr Butowski provides authoritative technical descriptions for each military aircraft - and every significant sub-variant - currently available from Russia’s aerospace industry, or otherwise in large-scale service. With the level of accuracy and insight familiar to Harpia’s regular readers, each aircraft profile also includes specifications, and details of operators, upgrades, avionics and weapons. The first of two volumes on the subject presents in-depth coverage of tactical combat aircraft, trainers, Army Aviation helicopters, reconnaissance and surveillance aircraft, airborne command posts and relay aircraft. As such, the breadth of this work extends from the latest multi-role fighters developed by Mikoyan and Sukhoi, via successive generations of combat rotorcraft, to airborne early warning and electronic intelligence-gatherers. As well as familiar types such as the Su-30MK family of fighters and Mi-24/35 assault helicopters that have proven so successful on the export market, Russia’s Warplanes extends its reach to the various new and upgraded types that are beginning to populate Russia’s rejuvenated air arms, including those still under development, including the enigmatic 'fifth-generation' Sukhoi T-50 fighter. Additional assets, including long-range bombers, maritime aircraft, strategic transport and tanker aircraft, theatre and special purpose transports, and air-launched weapons will be dealt with in Volume 2. 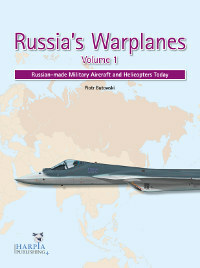 Supplemented by 200 photographs, some of which are from exclusive sources, as well as specially created maps and diagrams, Volume 1 of Russia’s Warplanes launches the most comprehensive study of the fixed and rotary wing aircraft types - manned and unmanned - that can currently be found in Russian service or which are being built or offered for export. This item was added to our catalog on Tuesday 08 March, 2016.